In this article, I will tell you about the 10 best TED talks for students out of millions that will change your life, or at least your perspective. 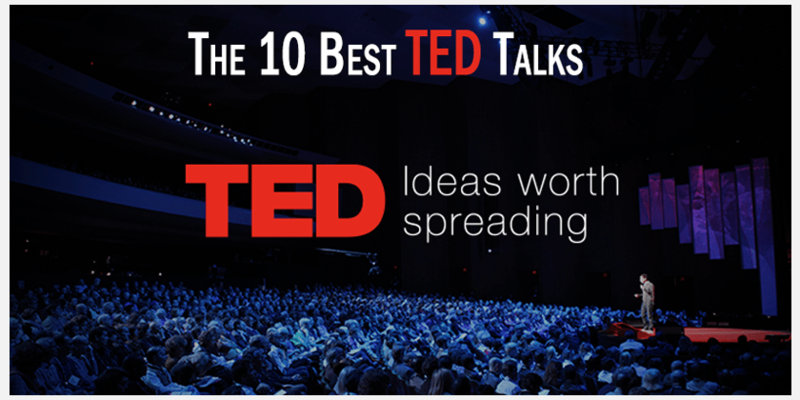 Basically, TED Talks are speeches given by a variety of professionals from all over the world, on a variety of topics. so, I am hopeful that after reading this article, you’ll surely check out at least any of these TED Talks and you’ll learn from it and grow from it. So, let’s get started! Precisely, in this TED Talk, he, with his great humorous and sarcastic tone, discusses the reasons why you are going to fail to have a great career. He says that most of us just wanna have a good career, not a great career, which itself is the biggest reason to fail. Therefore, he just wanna address the ones who want to have a great career but, unfortunately, fail to have. He explains the reason not to succeed for such people are that firstly, you are afraid to perceive the excuses about why you can’t find your passion which is one of the most important tools to have a great career; it’s all about matter of luck that you are not blessed with, you are not as weird and genius as those who succeed to have a great career, then there comes your family, friends etc whom you might consider much more valuable, and the list goes on and on. Amy Cuddy who is a researcher and a professor at Harvard Business School talks about human nonverbal behavior that how powerful and dominant they are. This type of behavior is proved to be similar both in human and animals; on the other hand quite different in both genders while expressing these gestures. Moreover, our nonverbal behavior governs who we actually are therefore she wants us to translate a better message to the world and also to ourselves. Cecilia McGough is the founder and Chief Executive officer at the student with schizophrenia. In her talk, she explains how difficult it was to live with schizophrenia as a student. Her talk makes you think about reality when all your sense betrays you. Moreover, it takes strength not only medication to ignore what they see and hear and courage to face the world around you while suffering from mental illness that nobody can understand except you. Hence, she is a true inspiration of fighting and then surviving with mental illness. In his talk, he says that it’s better to keep our goals to ourselves. when we announce our goal we feel it’s already achieved that makes it unlikely to happen found by psychologists as a social reality. Procrastination the biggest hurdle between you and your goals. Tim Urban initially, explains what is inside the mind of a procrastinator by using three characters namely the instant gratification monkey, you and then, there comes a panic monster as a deadline in deadline situations that vanishes in non-deadline situations. In addition, he says that we all are procrastinators in different situations. Kelly McGonigal is a health researcher who says that she has been revealing stress as the main enemy for past 10 years but discovered as a friend a few times ago. She says that harmful effects of stress are not inevitable. How you think and act can transform the effect of stress. When you choose to view your stress response as helpful you create courage biologically. When you choose to connect with people under stress create resilience. This way, you are able to say that you can trust yourself to handle life’s challenges in a better way. The monk Dandapani says that unless we are taught how to concentrate and practice how to concentrate, we can’t be good at. He adds that they first need to perceive mind to better their concentration as a monk. Moreover, he says that it is not mind that wonders but awareness. In his talk, he shares the spiritual tools to develop our concentration and the boundless benefits that result from it. In her talk, she tells you it’s best to be not fine. Because it is what that makes you work more to get what you want if you are not fine with what you have. She says that it is simple to get what you want but not easy. You need to force yourself because anything that is out of your routine needs force. In his talk, he examines success and failure and the paradox of modern expectations. He talks about how envy is the dominant emotion of modern society and how we all are driven by this phrase that what do you do asked by people around us at parties. Cameron Russell is a model. She says that image was powerful, but also superficial because her captured images as a model are all the masterpieces of passionate professionals.she ensures that she is going to answer those all questions which were asked as a model. Being a model is not that cool because you don’t feel comfortable, you feel insecure. You always need to wonder how you look. And also that you could find a better option than to be a model.